It is a welcome visitor to our little woodland patch who doesn’t call wildflowers weeds and sees beauty in brush piles. One of several brush piles that shelter birds and other wildlife. When such a person stops by as one did recently, I smile in silent gratitude for his or her appreciation of a setting that is friendly to birds and other living things, even though it lacks the carefully cultivated, meticulously planned look of the suburban gardens I so admire. But mostly now, those feelings are infrequent and easily forgotten when I hear a Wood Thrush singing in the spring or watch bats swooping overhead on a summer evening. Even in the fall, with leaves tumbling down as a reminder that winter will soon set in, there are delights to savor in migrating birds and the restful sounds of the earth settling down at the end of a busy growing season. Each day, I am reminded that much of what we enjoy was here long before my husband and I began preparing to live in this spot nearly 14 years ago. From the beginning, we saw ourselves as interlopers more than conquerors and were determined to minimize our intrusion as much as possible. Still, on the November day we ventured in, carrying colored string and spray paint to mark trees that would have to be felled, I still remember feeling anxious and not a little sad. Even though we were moderate in our choices for cutting – probably too much so for the sake of what would be built later – I felt like an invader. Pictures from a week later when the big machines arrived show me smiling. I suppose by then, I had resigned myself to the idea of what we were doing. I’d like to think remembering that sense of incursion, though, kept us both in check as we began to develop the site by adding a small barn, house, and trails through the woods. Always, we kept in mind what had been here when we arrived, a pattern that has continued to this day. 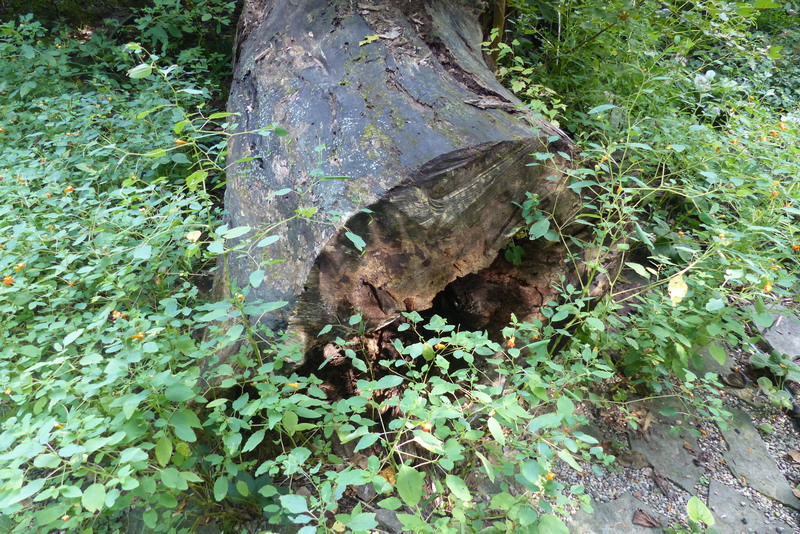 Jewelweed allowed to grow around a fallen log. Even as we occasionally fall victim to the prolific poison ivy around us, swat at mosquitoes, and encounter the digging habits of chipmunks and squirrels, we have resisted most interventions that would eliminate what some might consider nuisances. Our brush piles, built up with fallen tree limbs and providing shelter for wildlife, are just one testament to this. Another is our choice to relocate piles of fallen leaves rather than burn or bag them as refuse. Elsewhere, as I make an early spring effort to pull innumerable starts of native Jewelweed out of some areas, I let them grow in other spots, remembering that the hummingbirds will be enjoying nectar from their orange flowers in late summer. This sprig of Joe Pye weed popped up late in the summer between some stones. When I notice foliage being gnawed by who-knows-what insect, I take some comfort in thinking of the culprit as food for a bird, frog, or toad, satisfied that I haven’t poisoned or repelled an avian or amphibian friend with an arsenal of gardening chemicals. Likewise, milkweed, the bane of our farmer friends, is allowed some space because it is a host plant for the Monarch butterfly. And when I find salvia, coneflowers, and Joe Pye weed growing in cracks between the flagstone and popping up in places I know I didn’t plant them, I think fondly of the birds who are most likely responsible for adding such lovely, random diversity – and more food sources – to our landscape. It is good to know, too, as our recent visitor reminded me, that birders and others share our passion for an environment that is friendly to living things besides humans. Most importantly, though, I cherish the serenity that comes from living in harmony and partnership with the creatures and plants of a place that predates me and from recognizing and cooperating with its great design in the mind of the One who conceived it.